Welcome to the original home of your Handwritten Recipe engraved on a Bamboo Cutting board. As seen on the Today show for Mother's Day, Real Simple magazine and their Mothers Day Phone App, Country Living Magazine, US Magazine, and The Week Magazine. We are delighted to create a custom heirloom for your family. Our Etsy home page is http://www.etsy.com/shop/3DCarving You will see all our listings there. Thank you for visiting. This could be a great Mother's Day gift. 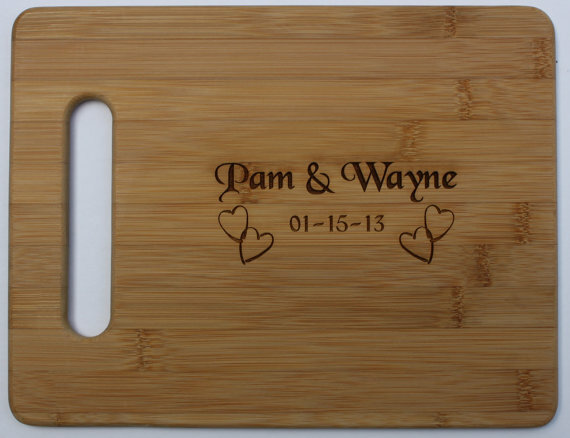 You can have your favorite family recipe laser engraved on a Bamboo Cutting Board. Custom laser engraved bamboo cutting board with your favorite family recipe. One side engraved with text height .22 so you can clearly read the recipe. A perfect gift to pass along your family recipes. A great gift for Mothers Day, bridal showers, or wedding gifts. Pass your recipe along as an heirloom to your kids and grand-kids. Please cut and paste your Recipe either in an Etsy Conversation once your order is placed. We will be happy to send you a proof in the evening. Items are shipped via US Postal service Priority Mail 3-5 days. You will receive a tracking number via Etsy. This is a perfect personalized Mother's day gift for your favorite cook. All Bamboo - we will engrave the handles of the spoons and spatulas personalize with a name engraved. Please send the name you would like engraved. Font is as shown. No proof will be sent - text will be cut and pasted from your request. Shipping is US Postal Priority Mail, you will receive a shipping conformation. 3DCarving offers the highest quality of Laser designs and 3D carved signs on the market today. Since 2000, we have provided superior service to our customers and have assisted them in creating wonderful heirlooms to cherish.. Our years of experience and commitment to excellence have earned us the reputation as the best engravers of custom signs and awards in the area.